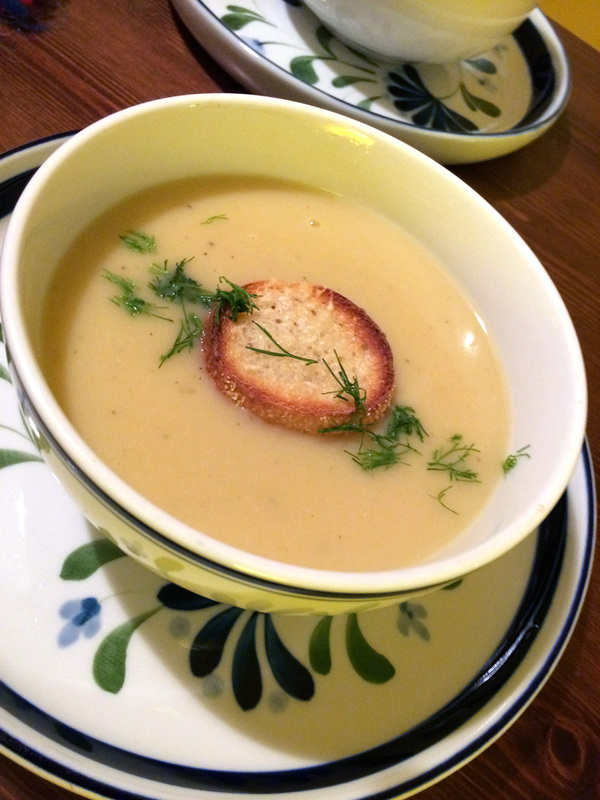 This entry was posted in Food, Soups and tagged Cold Soups, fennel, leeks, Potato leek and fennel soup, potato soup, Vegetarian, Vichyssoise by bitsandbreadcrumbs. Bookmark the permalink. Mmm! Sounds lovely – pity I just used up my leeks. I could have tried it – next time though. 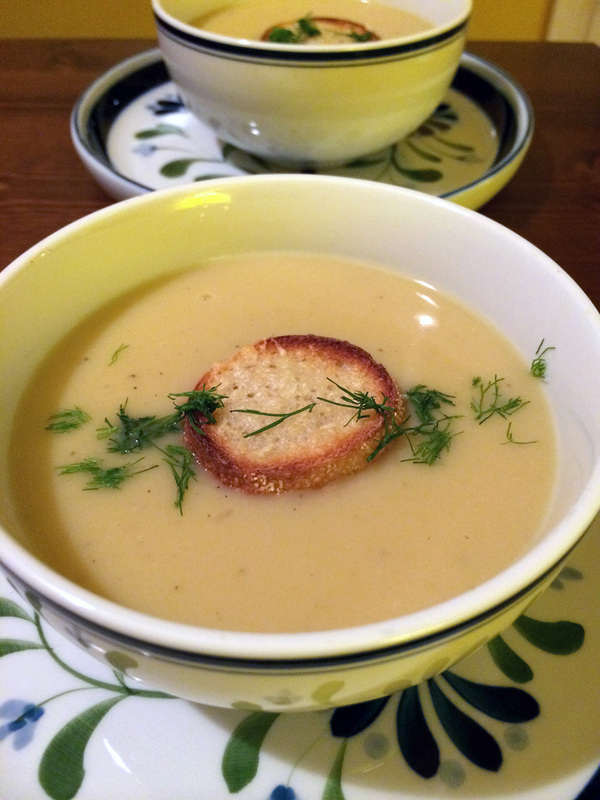 Potato and leek soup is fairly common at our house but I like the addition of fennel. Thanks, Bunny. The fennel really adds another dimension to potato and leek soup, as does the tiny bite of parm. Oh yes, parmesan would be great! This would be just the perfect soup for a cold rainy.. er snowy day for us! I love that you were inspired by a gratin to make this.. even including the parmesan flavors in a crouton is brilliant! I hope you get less rain and we get less snow!! Wishing you and your loved ones a wonderful 2014, Betsy!! Am such a fan of soup – even in the middle of summer in Sydney I could easily wolf down a bowl of this yummy looking soup. Actually this soup is as good cold as it is hot, so summer in Sydney would be no problem! 😉 Glad you like it! This is definitely a soup for that kind of weather we’ve been having… We marveled on Saturday how it could be in the 50’s..and that I had my windows open to freshen the house, when just a couple of days before it was below zero!! There is no figuring out mother nature and her weatherly ways.. Thanks! 🙂 I’m glad you like the background and header, too. If we ever get snow, I’ll change it, otherwise it is my “Winter” look. I honestly haven’t thought to put fennel into a soup before, and I have no idea why because I LOVE the stuff. I’m sure it paired perfectly with the potato and leek. It’s really so inviting. Hope it’s warmed up where you are, it is here which is making all the ice and snow melt into a mess. Perfect soup weather for sure. I don’t know many other soups that I might try with fennel, but it is really delicious in this one and well balanced, doesn’t overpower anything. It’s considerably warmer here and raining again, just as predicted. Soupy weather indeed! “Velvety” is the word that came to my mind when I saw your soup. Your soup and my salad would make a great meal combo. This is perfect timing. A friend just sent me a text asking me what to do with leeks as she had never cooked with them. I randomly went through some ideas, however, when I saw this, I just know she will love it!! and me as well! I love the presentation with the small toast on top too! How cool is that? I hope she likes it. The anise flavor of the fennel is subtle to me, but then I like fennel…which is funny because I hated that flavor as a kid and adore it now! You must have the toast on top with the parmesan, otherwise it won’t mimic my gratin recipe. 😉 Thanks, Linda! I’m definitely in need of less rain (and more sun) here in the south. After Saturday’s tornado warning and more rain, sun is in order! I’ve not a potato soup yet this winter and so I’m inspired to try yours. I love the addition of leeks (under-used in my opinion) and fennel. I’ll make it next week with lots of parmagiano-reggiano cheese! You’re so welcome, Allison and I hope you enjoy the soup. I had some for lunch today and it was still really good. Love soup anytime, I must say. 🙂 Here’s to sun and normal winter here in the South! Thank you, Kay. I had some for lunch today and you’re right, good for any meal, except maybe breakfast! 🙂 So glad you like it. This is perfection. Looks so positively creamy and the fennel is such a great addition to a traditional leek and potato soup. Can’t wait to try it…but I must wait a day or two or so…it’s 84 degrees F. here today and it’s supposed to do a 180 also in a couple of days. Thank you Geni! True, hot soup isn’t what you want to make or eat usually when it’s 84 degrees. However in the case of this particular soup, it’s as good cold…like a vichyssoise…as it is hot. This weather is wacky, isn’t it? Who ever heard of a polar vortex before last week! I adore leek and potato soup – I never had it with fennel though. Why not though, right? I would think it makes for a great combination. Will have to remember that next time. My parents-in-law abhor blended soups, so I’ll have to wait until we move out though, lol! Oh dear! That’s a strong reaction to blended soups indeed, Charles. Yes, do wait until you can enjoy without offending anyone’s sensibilities. 🙂 And, I think you’ll love the fennel addition to the soup!